How many times have you heard, It’s all in the details.”? Probably about a bazillion. Well…that certainly proved to be true when it came to decorating the Chic Chateau showhouse. Take the full tour HERE in case you missed it last week. The concept behind the Chic Chateau showhouse is to inspire and show all of us ordinary folks how to achieve a designer look on a budget. Almost all of the items in the home were purchased from thrift stores, Craigslist and other thrifty venues. Today, I want to take a closer look at how the designers transformed ordinary items, that you likely wouldn’t look at twice, and turned them into things of beauty. The decor theme of the home is mid-century modern. Along with the design theme, the designers were given a color palette to work within so that the overall look of the home would flow. 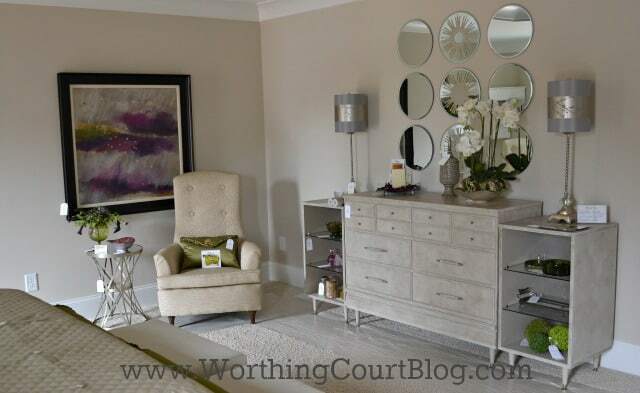 As you’re looking through these photos, it might help to switch back to the house tour to get a feel for the entire room that each of the items are in. 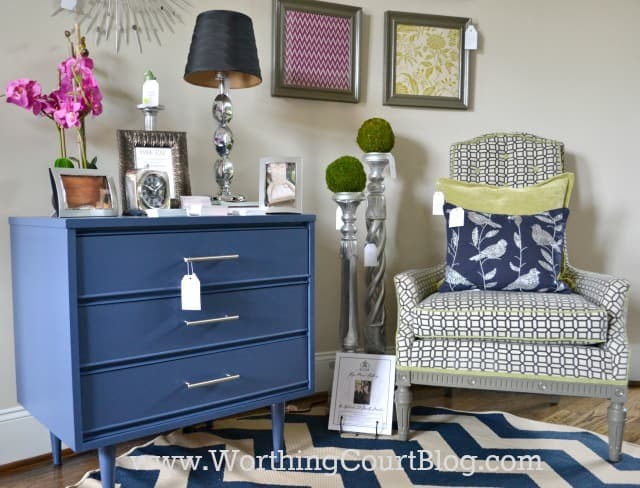 Let’s start in the foyer where a coat of paint on a thrifted chest and a reupholstered chair breathed new life into these mid-century modern pieces. 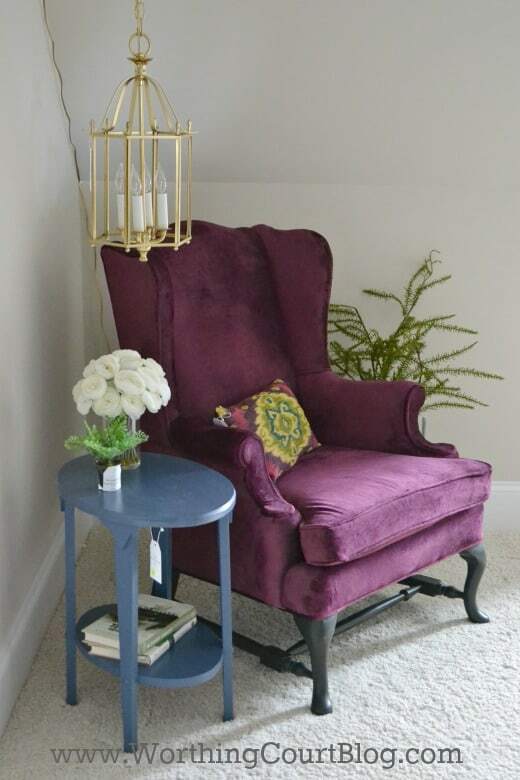 Take a closer look at the chair and you’ll see that the frame has been painted to tie in with the upholstery fabric. 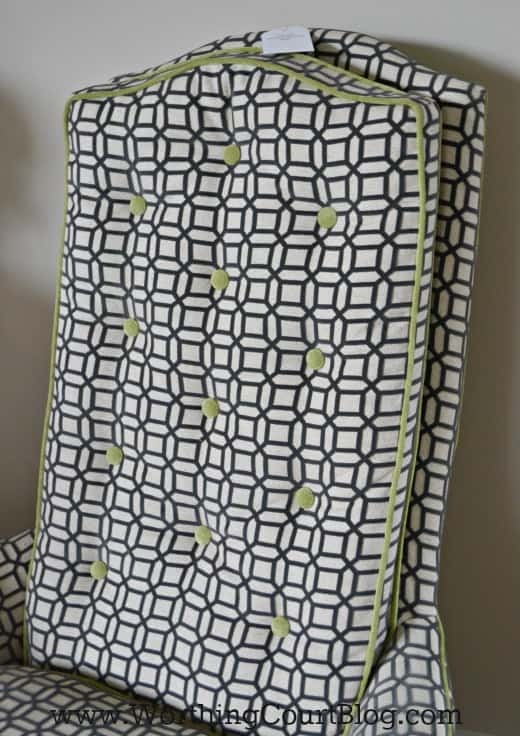 The designer really made it a wow piece by using contrast fabric on the welting and covered buttons. 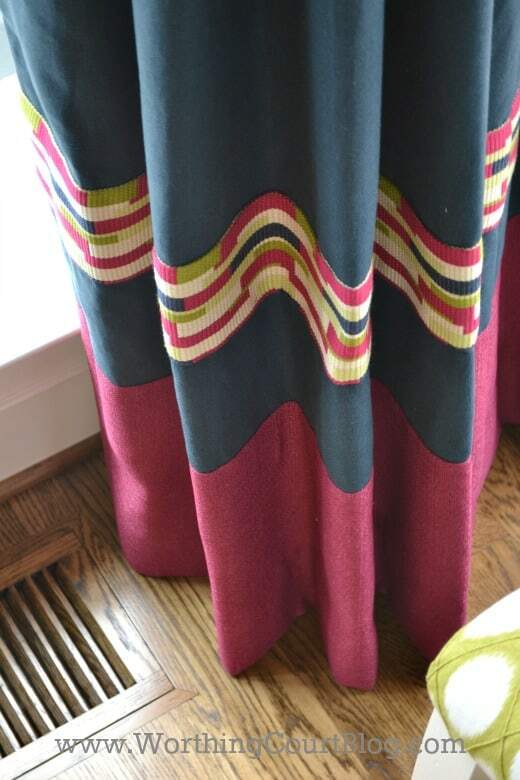 In most of the rooms, it was all about the fabric. 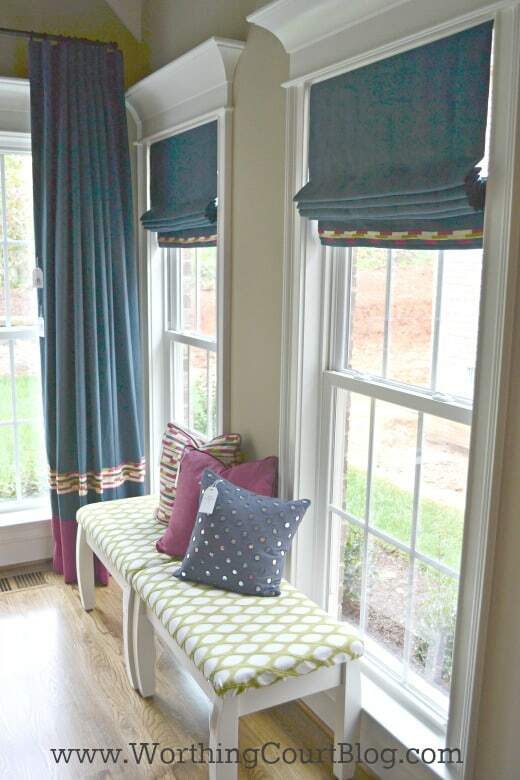 Gorgeous, vibrantly colored fabrics, all in the color palette specified by the lead design team for the house. 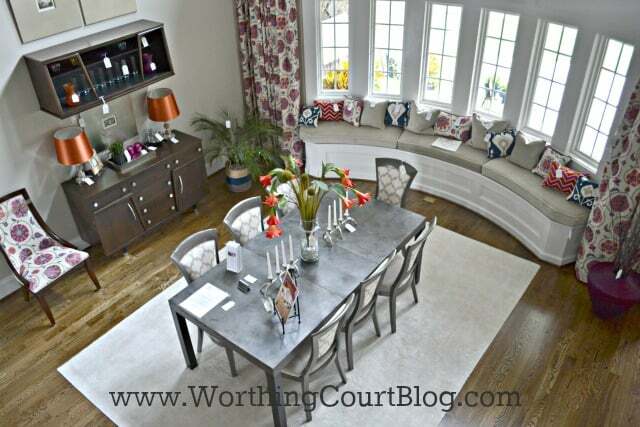 For example, the fabric used on this club chair set the stage for the family room. …and on the roman shades and a bench pillow. 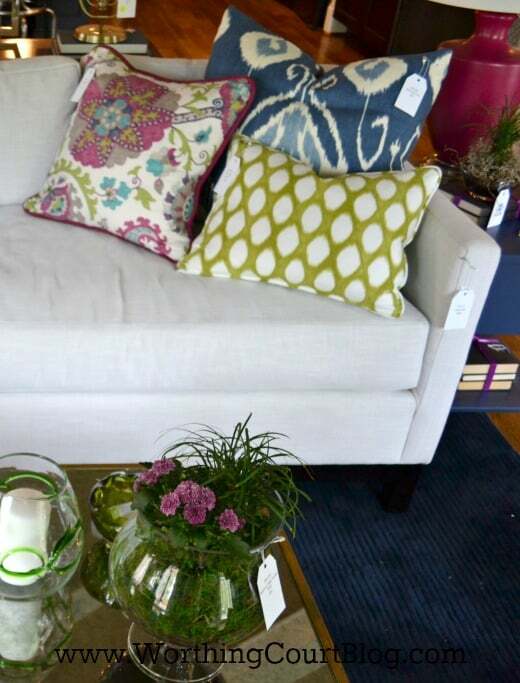 Pillows on the sofa repeat the colors. 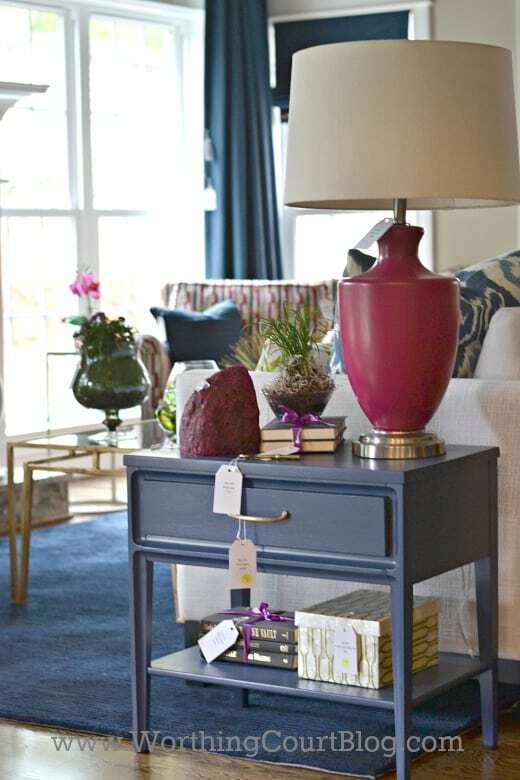 Thrifted end tables and lamps were painted in a deep shade of blue and radiant orchid. The family room and dining room are open to one another, so it was a smart decision to repeat the suzani print fabric used on the sofa pillows in the dining room draperies and some of the chairs and bench pillows. The designer for the kitchen repeated the suzani print fabric in the napkins and used vintage albums as chargers on the island. Anybody remember those? If you’ve ever priced oyster plates, you already know how expensive they can be. 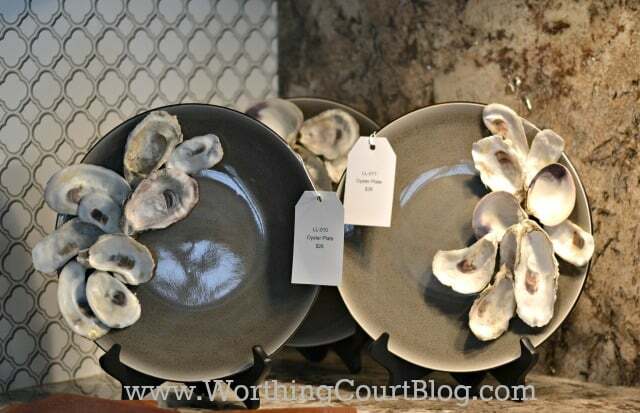 Make your own by gluing oyster shells onto plain plates. 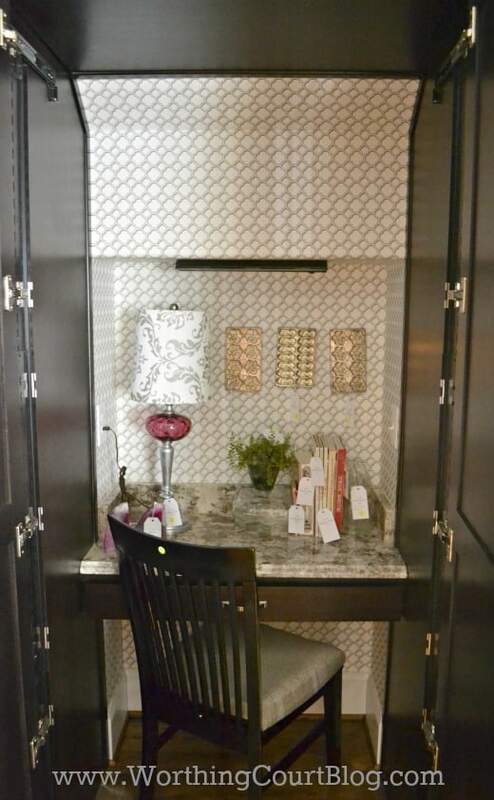 An office area was tucked away behind large pantry style cabinet doors in the kitchen. It was really cute, but I’m not sure how much I’d like to work in such a confined space. The master bedroom was on the main floor and was one of my favorite rooms. The colors in there are a little more restrained and subdued, which gave a very serene and elegant feel to the space. The dresser is made of up three different pieces – a small dresser in the middle and a small shelf unit on each end. 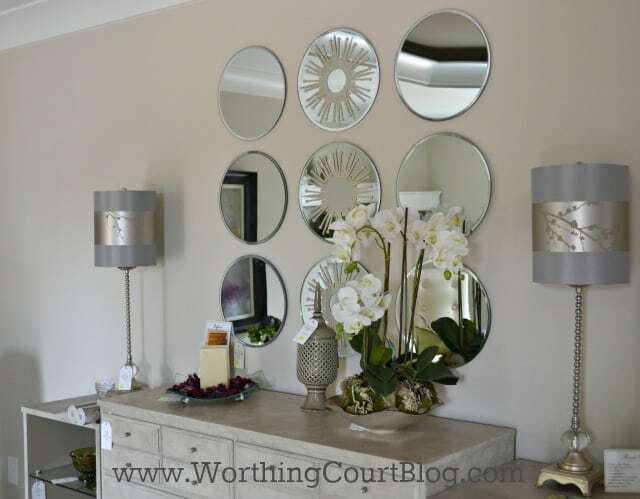 A grouping of round mirrors was used instead of one large one above the dresser. Did you notice that the middle mirrors have a gold design overlayed on them? I couldn’t tell if it was a vinyl cutout or if they were stenciled on. Each of the lampshades is wrapped with a strip of wallpaper that was used an accent above some other shelves in the room. 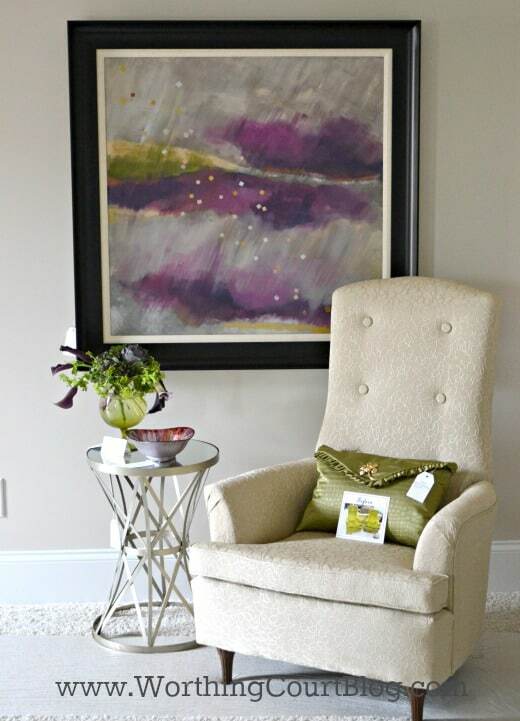 A piece of diy artwork brings in all of the colors in the house into the master in an understated way. Another room on the main floor was a girls bedroom. 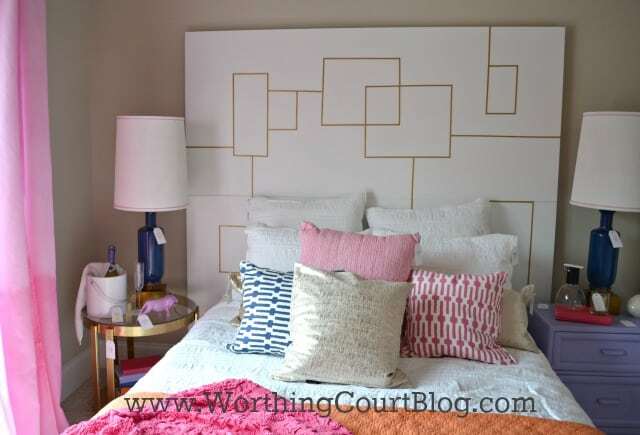 The headboard is made of two painted doors, one stacked on top of the other, with small pieces of gold painted wood applied in a retro’ish design. 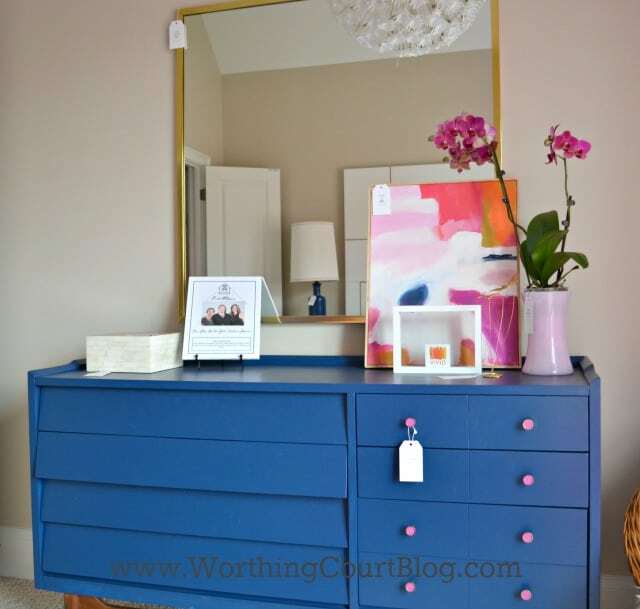 The knobs on the painted dresser give a pop of the radiant orchid color. A bedroom up on the second floor has a reading nook made all the more cozy by the addition of a plug-in lantern suspended from a chain. 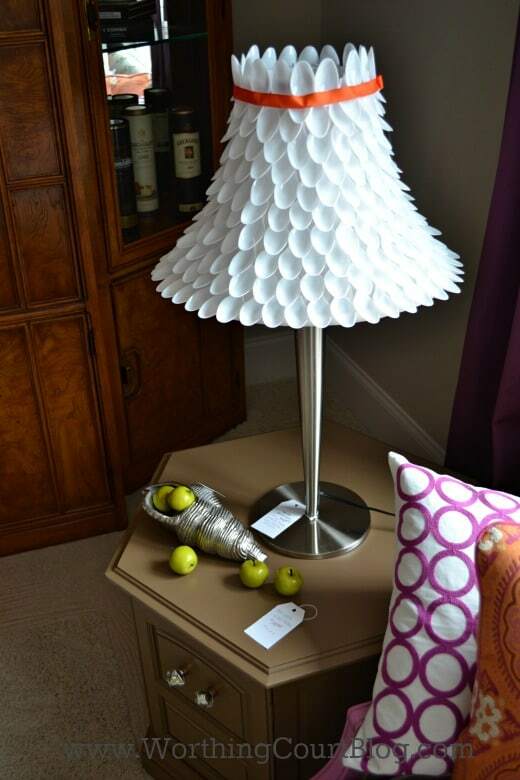 And lastly, this lampshade covered with plastic spoons is so cute. I love how the top is finished with spoons pointing in the opposite direction. Wrapping ribbon around the shade is a good way to hide the ends of the spoons. Did you find some inspiring ideas? I love the way it’s all tied together. Every room has elements of the main colors. Very creative!! Hi Marisa. I was amazed at how the house flowed even though each room was decorated by a different designer. I love color so all of the rich colors really appealed to me. 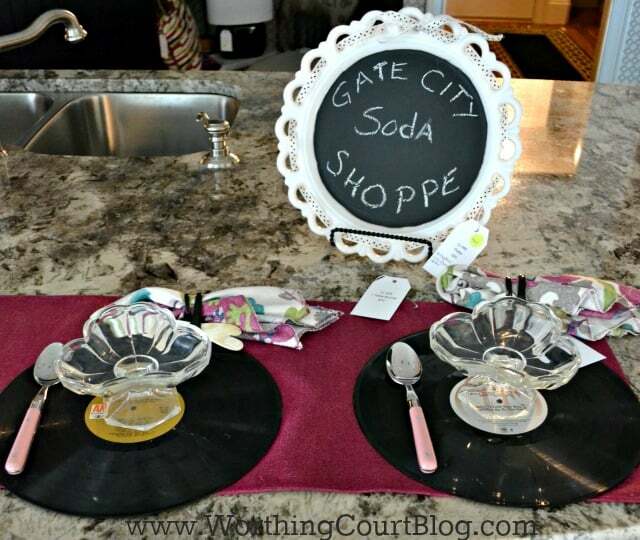 What a fun idea for a show house! While some of this is not my style – the ideas a wonderful and applicable to pretty much any style! I especially love the dining room. Glad you enjoyed the tour, Michelle. 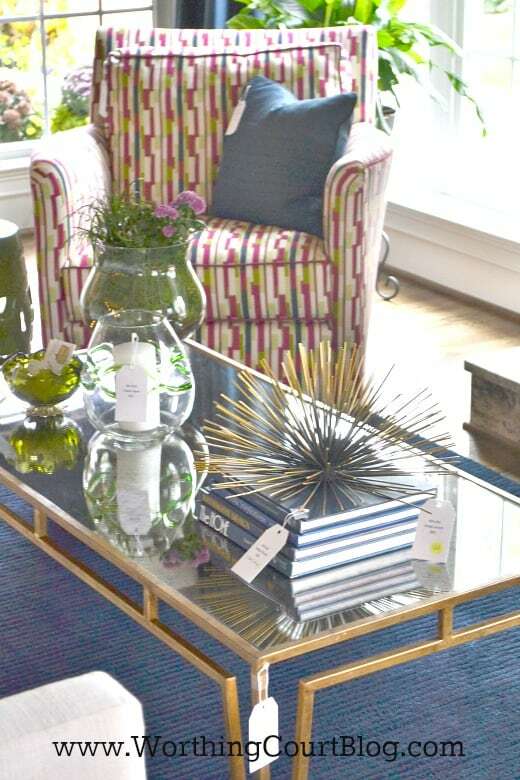 I agree with you – many of these decorating ideas could be applied no matter the style of the decor. The dining room was amazing and the fact that it was located in an unexpected place made it all the more dramatic to me. I had a chance to see this house in person and I took inspiration photos of several of the same items. The master bedroom was my favorite room too. Beautiful pics, Suzy. You did a great job! I did find inspiring ideas and I missed al of those details when I viewed the tour photos! That’s so good to hear, Lydia. It’s often hard to really do a room justice when just photographing the entire thing. I’m glad you came away inspired! You’re more than welcome! Thank you for stopping by. 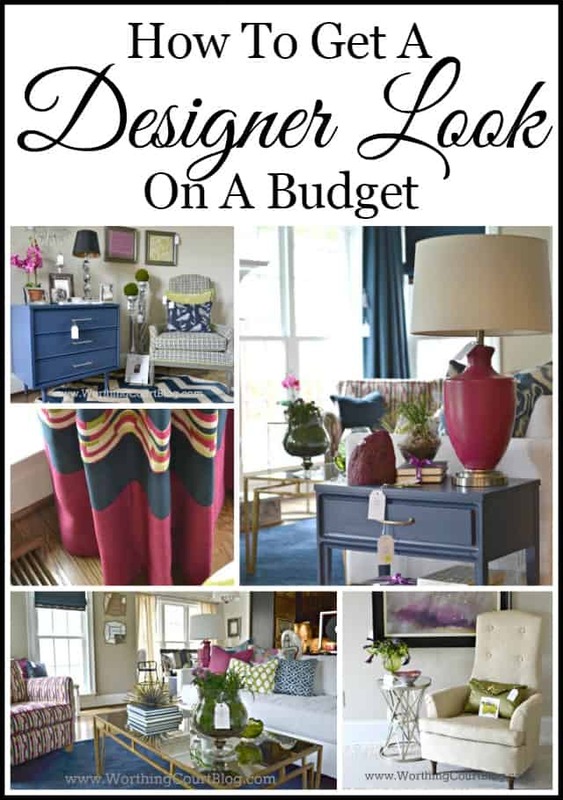 Great post and such pretty and inspiring rooms. Thanks tons for linking to Inspire Me. 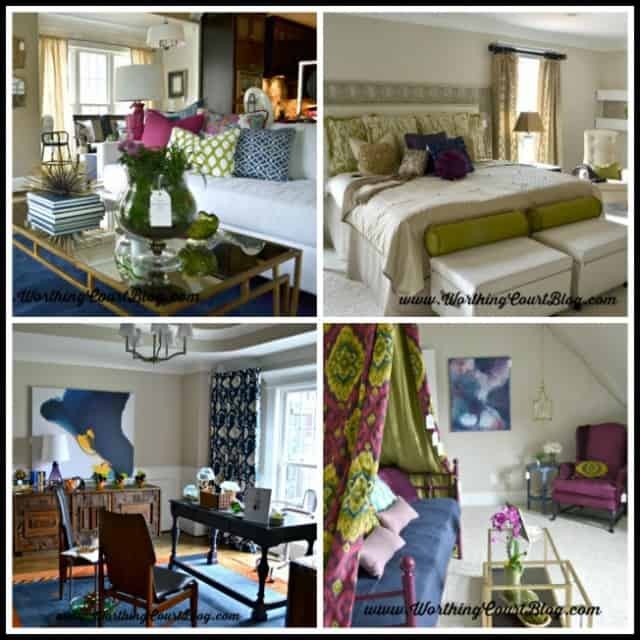 Thanks for sharing these inspiring designs, I love the drapery and this nuance of blue. I’m glad you were inspired, Lisa. I love the draperies too. Lovely! It’s great to see how it all came together. Thanks for linking up at Show Me Saturday. Hope to see you there again this week!